Eastbound UP 6479 leads a unit cement train through the MVW, seen here crossing the wash for the 10th time since leaving Moapa, 50 miles south of here. 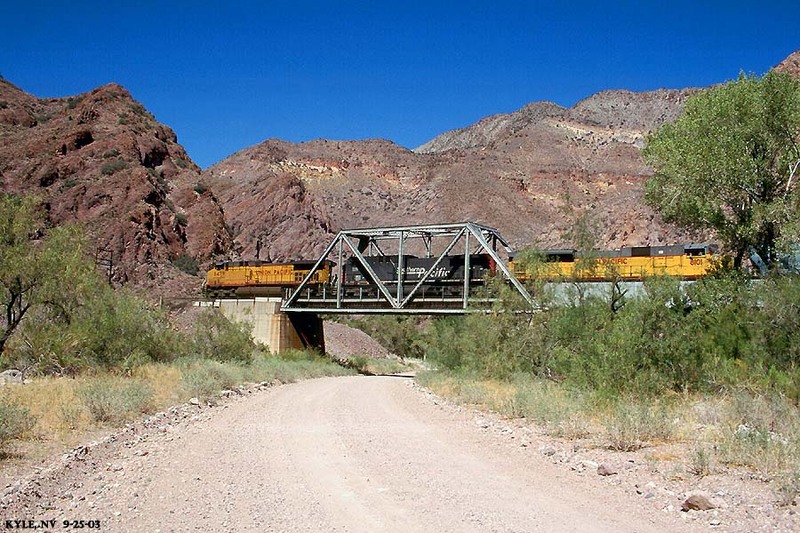 The wash is never more than a mile from the tracks for the entire 80 mile route. The weekend trip began in Las Vegas, NV, Thursday morning, 9-25. The purpose of the trip was work, but that would only encompass the first half of Friday, leaving time for some great railfanning in spectacular Utah during the height of the fall color change. My original plans were to join the tracks at Milford, Utah and follow north from there as much of the line as possible. An early departure from Vegas made me consider a second plan, to follow the line from Moapa, NV through the Meadow Valley Wash and along the "Omaha Road" to Milford, UT. This decision would mean deciding to drive along dirt roads for nearly 100 miles of the 400 mile trip to Salt Lake City. The decision was easy though and I eased my truck off of I-15 onto an exit which would bring me trackside in a mere few miles.